Sariya during a school exercise. 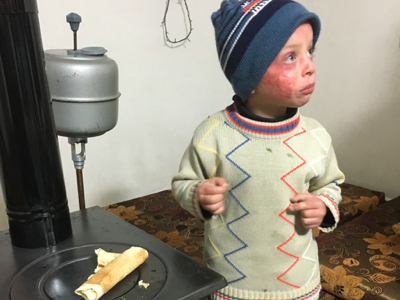 The other children are kind to him for the most part, said Lozan Kurdi, a teacher, but some have stopped going to class because they are scared of his skin condition. In his class, just across the street from his home, Sariya sat around a table with other Syrian children, looking noticeably smaller; even with his heavy sweater, loose jeans and wool hat, his slight frame was obvious.Sariya with his sister Amani. After the rocket hit the family’s home in Syria and they were forced to leave relatives’ home, they camped out in an abandoned house for eight months before fleeing to Lebanon in 2014. Sariya with his sister Amani. After the rocket hit the family’s home in Syria and they were forced to leave relatives’ home, they camped out in an abandoned house for eight months before fleeing to Lebanon in 2014.